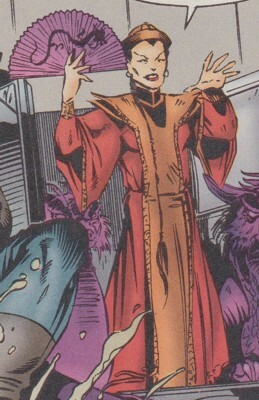 Powers/Abilities: Yang Kwei Fei is a small person who possesses telepathy, enabling her to read people's minds. She can also see into the future and perform a variety of mystical feats including minor ones like card tricks or more major ones like transforming others into monstrosities, shrinking or mystically controlling them. As a master of ancient magics she can easily counter even old demons like Shelob. (Blaze II#7 (fb) - BTS) - Barely anything is known about Yang Kwei Fei's past. At some point two men committed some sort of atrocious act that got them on the bad side of Yang Kwei Fei. As punishment she mutated them through magic into the six-armed Roach and the clawed contortionist Lobster Lad. They had to serve her until she deemed they had redeemed themselves and only then she would revert them to normal. (Blaze II#7) - Fei and her slaves Lobster Lad and Roach disturbed Blaze at night in his trailer to ask for a job at the Quentin Carnival. Impressed by their introduction and tired Blaze hired them. The next morning Roach, carrying Fei inside her box, and Lobster Lad approached Blaze and thanked him for hiring them. Later Fei and her slaves visited Blaze in hospital after he got injured when Double-Tap, an expert shootist, shot him during a performance. 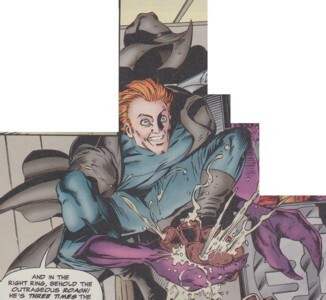 Fei read Lt. Bert Wegner's mind to learn about Double-Tap's brother Lucius Tapp, who had been under police surveillance since his brother and friends robbed the Quentin Carnival. Carried by Roach Fei broke into Lucius Tapp's home and read his mind, learning he had given his brother the keys to the Municipal Aquarium he owned. At the Municipal Aquarium Fei, sitting on Roach's shoulder, told Kody and Wolf that Lobster Lad should've worked his way from the aquarium's ducting system by now. She then entered the aquarium with Roach and reminded him what she had promised them a long time ago. The trio confronted the criminal shootists. (Blaze II#7 - BTS) - Fei used her mysic powers to transform Lobster Lad and Roach back to their human forms, making Double-Tap, Tex and Aura-Lee their successors. Double-Tap became the new Lobster Lad, Tex the new Roach and Aura-Lee became Fei's loyal serving monkey. (Blaze II#7) - Fei left the Municipal Aquarium alongside her new slaves. Roach was carrying the box with Fei inside. The next day Fei and her slaves performed at the Quentin Carnival. 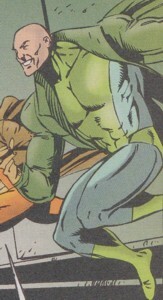 Lt. Wegner was shocked when he realized that the criminals he was searching for had been turned into attractions by Fei. During her performance Blaze promised Fei to not point the authorities into her directions as long as she helped him find his children. After her card trick Fei ordered her monkey Aura-Lee to pick up the cards. (Blaze II#8 (fb) - BTS) - Because she didn't see it as important as it wouldn't threaten Blaze's life she didn't warn him about Arcade, who, posing as the Mad Monk, infiltrated the Quentin Carnival employed by Baal's high priestess Amanuensis, who sought to get her revenge on Blaze for thwarting Baal's return to Earth. (Blaze II#8) - Her mentalist powers showed Fei that Kody and Princess Python were trapped within Arcade's Murderworld and she told Blaze and Wolf about it. She watched Blaze save them. Afterward Blaze confronted Fei about why she didn't warn them earlier and Fei explained that she saw no reason to bother Blaze with something that had no consequences for him. (Blaze II#9 (fb) ) - Fei knocked on the door of Clara's wagon to tell her that the Oculist was searching for Clara at the Quentin Carnival. 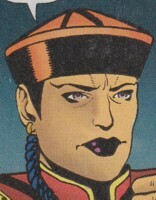 (Blaze II#9) - Fei and Princess Python held down Clara Menninger in her trailer when the Kristall Starrer's shadow attacked Quentin Carnival. (Blaze II#11) - Not willing to just stay behind while Blaze, the Punisher and Clara dealt with the Undead MC Fei offered to lead the others to them using her powers. (Blaze II#12 - BTS) - While travelling through the New Jersey Turnpike overpass the Quentin Carnival encountered the demoness Shelob. Using her ancient magic Fei easily caught the demoness Shelob, shrunk her down and put her in a jar. (Blaze II#12) - Fei and the other carnies met up with Blaze, his children, Clara, the Punisher and Jesse Pinto. Kody told Blaze about their run-in with Shelob and how Fei had caught the demoness. Lobster Lad (Double-Tap) showed Shelob trapped in a jar to Blaze and the others. As Lobster Lad he had claws instead of hands and an extremely bendable body. His claws were strong enough to crush a six pack. Due to his contortionist skills he could crawl through venting shafts and other tight places. (Blaze II#7 - BTS) - At some point in the past the man, who would become Lobster Lad, did something that got him on the bad side of Yang Kwei Fei. As punishment she transformed him through magic into the crab-like contortionist Lobster Lad, forcing him to serve her until she deemed one day that he had redeemed himself. (Blaze II#7) - Lobster Lad, Roach and Fei introduced themselves at night to Blaze in his trailer. He hired them and the trio thanked him the next day for the opportunity. After the Quentin Carnival got robbed by the shootists Double-Tap, Tex and Aura-Lee Fei found out they were hiding at the Municipal Aquarium and sent Lobster Lad through the ducting system inside. Fei and Roach soon followed him and together they confronted the shootists. (Blaze II#7 - BTS) - Fei turned Lobster Lad back to his human form. (Blaze II#7) - The former Lobster Lad and Roach ran out of the Municipal Aquarium and to the surprise of Blaze, Clara, Kody and Wolf they were human and finally free. As Roach he had six arms and a skilled juggler. He could climb up walls with ease like a real cockroach. 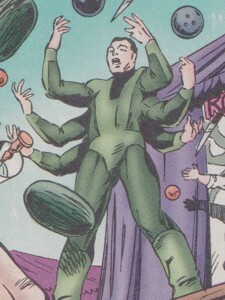 It is unknown if he retained some of his juggling skills as a human. (Blaze II#7 - BTS) - At some point in the past the man, who would become Roach, did something that got him on the bad side of Yang Kwei Fei. As punishment she transformed him through magic into the crab-like contortionist Lobster Lad, forcing him to serve her until she deemed one day that he had redeemed himself. After the Quentin Carnival got robbed by the shootists Double-Tap, Tex and Aura-Lee Fei found out they were hiding at the Municipal Aquarium and waited outside with Roach while Lobster Lad worked his way through the ducting system inside. Reminding Roach of the promise she had made him and Lobster Lad long ago Fei and Roach went into the Municipal Aquarium to confront the shootists along with Lobster Lad. (Blaze II#7 - BTS) - Fei turned Roach back to his human form (in a very racist move she turned him white). At first Aura-Lee was a blonde shootist, then she was a monkey. 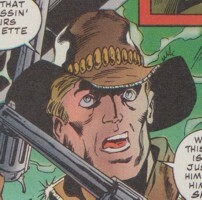 (Blaze II#7) - The blonde Aura-Lee was part of a shootist group with Double-Tap and Tex. They offered their services to Blaze, but he didn't want to hire them for the Quentin Carnival. Displeased they robbed the carnival and took off in a car. (Blaze II#7 - BTS) - They got the keys to the Municipal Aquarium from Double-Tap's brother Lucius, then hid out at the aquarium. (Blaze II#7) - Aura-Lee and her friends partied at the Municipal Aquarium and had a good laugh over the misery of Blaze and the Quentin Carnival's cashier, who had been shot by Tex. They were confronted by Yang Kwei Fei, Lobster Lad and Roach and while the latter two were released by Fei, Double-Tap and Tex took their place and Aura-Lee was transformed into a monkey by Fei's magic. The next day during Fei's performance at the Quentin Carnival Fei ordered around the monkey Aura-Lee, who had to pick up her cards after a card trick. (Blaze II#9 (fb) ) - Aura-Lee and Fei sat on Lobster Lad (Double-Tap)'s shoulders when he brought Fei to Clara Menninger's wagon to tell her that the Oculist was at the Quentin Carnival searching for her. 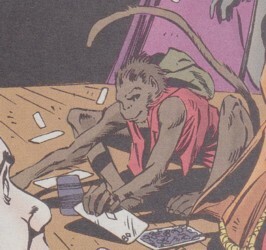 (Blaze II#9) - Monkey Aura-Lee was running around scared when the Kristall Starrer's shadow attacked the Quentin Carnival. Other performers tried to calm her down. Double-Tap (Tapp, first name unrevealed) was an expert shootist. Mutated into Lobster Lad he possesses claws instead of hands and an extremely bendable body, making him a very capable contortionist. 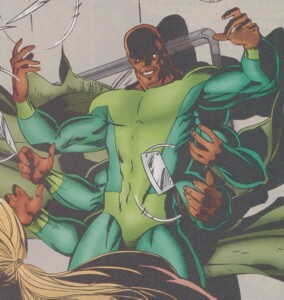 (Blaze II#7) - Double-Tap was the leader of his group and the self-proclaimed greatest shootist in the world. He tried to show off to Blaze, shooting around Blaze's shadow behind him, but it didn't convince Blaze to hire them. Instead he told Double-Tap, Tex and Aura-Lee to leave the Quentin Carnival within 8 seconds. Shortly after they took their revenge on Blaze. Double-Tap shot the burning rope Blaze was riding on during a performance and Blaze got injured during the fall. 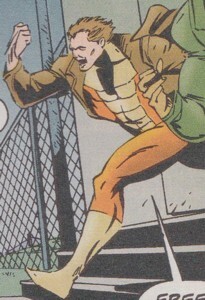 He ran outside to rejoin with Tex and Aura-Lee, who had robbed the Quentin Carnival's cashier. Together they drove off in a car. (Blaze II#7 - BTS) - Double-Tap got the keys to the Municipal Aquarium from his brother Lucius. Double-Tap and his friends hid out at the aquarium. (Blaze II#7) - Double-Tap and his friends partied at the Municipal Aquarium and had a good laugh over the misery of Blaze and the Quentin Carnival's cashier, who had been shot by Tex. They were confronted by Yang Kwei Fei, Lobster Lad and Roach and while the latter two were released by Fei, Double-Tap was turned into Lobster Lad while Tex was turned into Roach and Aura-Lee ino a monkey by Fei's magic. The next day Double-Tap performed a contortionist act as the new Lobser Lad. Lt. Wegner was shocked when he recognized him as the criminal he had been searching for. (Blaze II#8) - Lobster Lad stood at Roach and Fei's side when Blaze asked Fei why she didn't warn him of Arcade. Fei explained that she didn't consider him an important threat. (Blaze II#9 (fb) ) - Lobster Lad carried Fei and Aura-Lee to Clara Menninger's wagon where Fei told Clara that the Oculist was at the Quentin Carnival searching for her. 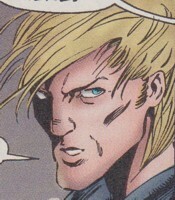 (Blaze II#9) - Lobster Lad was scared when the Kristall Starrer's shadow attacked the Quentin Carnival. (Blaze II#11) - Lobster Lad was at Fei's side when she offered to lead the other carnies to Blaze, who was fighting the vampiric Undead MC. (Blaze II#12 - BTS) - Lobster Lad was present when Fei caught the demoness Shelob at the New Jersey Turnpike overpass. 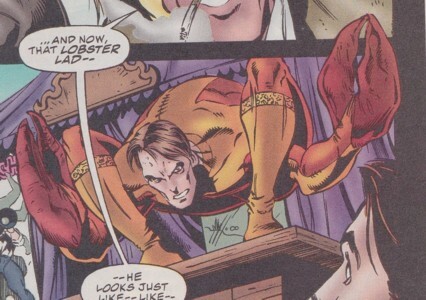 (Blaze II#12) - Lobster Lad was holding on to the jar with Shelob inside. He showed it to Blaze. Tex was a skilled shootist, who could handle a shotgun. As Roach he had six arms and impressive juggling skills despite no previous experience. (Blaze II#7) - Tex was a shootist working with Double-Tap and Aura-Lee. When Blaze had no interest in hiring the trio they took revenge on Quentin Carnival, robbing them. Tex shot the cashier Buster with a shotgun. He then fled in a car along with Double-Tap and Aura-Lee. (Blaze II#7 - BTS) - Tex hid out with Double-Tap and Aura-Lee at the Municipal Aquarium that was owned by Double-Tap's brother Lucius. (Blaze II#7) - Tex and the others partied at the Municipal Aquarium and had a good laugh over the misery of Blaze and the Quentin Carnival's cashier, who Tex had shot. They were confronted by Yang Kwei Fei, Lobster Lad and Roach and while the latter two were released by Fei, she used her magic to turn Tex into the new Roach, Double-Tap into Lobster Lad and Aura-Lee ino a monkey. The next day Tex performed a juggling act as the new Roach. Lt. Wegner was surprised because the last time he saw Roach he was black. (Blaze II#7 - BTS) - Lucias Tapp was the owner of the Municipal Aquarium in LA and the brother of the shootist Double-Tap. After his brother and his colleagues Tex and Aura-Lee had robbed the Quentin Carnival Lucius gave his brother the keys the aquarium so they could hide out there. (Blaze II#7) - Fei and Roach broke into his apartment and Fei read Lucius' mind to learn where his brother was. (Blaze II#7 - BTS) - The police found Lucius raving and screaming about monsters and a headache. (Blaze II#7 (fb) - BTS) - Lt. Wegner was a member of the Los Angeles Police Department. He was appointed to the case of the Quentin Carnival robbery and had the brother, Lucius Tapp, of one of the culprits put under surveillance. (Blaze II#7) - He visited Johnny Blaze in hospital after the Quentin Carnival got robbed by Double-Tap, Tex and Aura-Lee. Fei read his mind to learn about Lucius Tapp, brother of Double-Tap. Wegner visited the Quentin Carnival the next day to confront Blaze about stealing his own motorcycle from the police's impound, but he couldn't prove it was Blaze because the bike from the impound was totaled unlike the bike Blaze was currently using. He also told Blaze that Lucius Tapp had been found this morning and that someone had broken in to the Municipal Aquarium last night. When Wegner saw Roach and Lobster Lad he was surprised that the former was not black and anymore and shocked that the latter's face looked like Double-Tap. Without any prove against Blaze or any of his performers Wegner was forced to leave.